Last week, we drove more than two hundred fifty miles north of Las Vegas, in the middle of the Great Basin National Park to see a gnarly and wrinkled pine tree in the isolated Nevada desert. To find the grove, at a literally breathtaking altitude of 12,000-feet, you must first scale Mt. Washington. The Bristlecone Pine is the oldest living thing on Earth and thrives where conditions are harshest. Many of these trees sprouted well before the birth of Jesus yet still are alive today. At a rough camp at the foot of Mt. Washington, some of the world's finest minds gathered to consider how to build a unique clock inside the mountain: designed to measure time for 10,000 years. Most of us think of "future" in terms of months, years, or perhaps decades, but for Danny Hillis, his dream is to construct a purely mechanical clock at this desolate site to welcome ten millennia. The clock is just one of the many astonishing projects undertaken by The Long Now Foundation, led by Stewart Brand (founder of the Whole Earth Catalogue, with other luminaries like Brian Eno, technology guru Esther Dyson, and photographer and writer Kevin Kelly, sharing visions of how mankind might connect to a time most of us barely contemplate. Camping at the foot of this mountain where the massive clock will one day reside and listening to these wise friends discussing the "long now" future is a profoundly fascinating education. The weather changes radically here in the desert: sweltering days, frigid nights, with frequent storms and fierce winds. To best commune with nature and mankind's tenuous place in it, more thoughtful people might come to this desolate and beautiful place with the barest essentials. But for me, gadget guy from New York, this was another opportunity to cram as much cool gear as I could find into a four-wheel drive. In a way, "gear" reassures us: asserting humanity's fantasy of achieving dominance over our surroundings. And, to be sure, mankind has inched forward. For example, new materials have radically transformed camping tools and equipment in the last five years. Backpacks that once weighed more than ten pounds "empty" now weigh a mere two pounds. Tents and sleeping bags are also a quarter of their former weight. The best camping experiences surely are those without fancy electronic doodads, but if you must bring it, you must power it so a host of neat power charging solutions emerged, as I'll describe below, and more! Almost thirty years ago, I was ecstatic when my external magnesium frame backpack was finally tossed into the fire pit. The dawn of the internal frame backpack had arrived, with heavy waist belts to shift the weight from shoulders to hips. The latest revolution in backpack design is to replace the entire pack with a seemingly flimsy sliver of a frame and straps that surround a dry bag containing your belongings. Dana Design's Raid Z lets you compress your gear in this elegantly crafted backpack and wisely provides space to slide a lightweight 2 to 3 liter water-bladder in as well. For about $200, this backpack is so spare you wonder how it can take the weight, and at a mere 2 pounds 14 ounces, it is a miracle it does so well. No wonder it won Outside Magazine's top rating in 2004. Available in black/mustard and black/flint colors. At $350, Mountain Hardwear is right to call this a "sleeping system" and not a mere sleeping bag. Despite the fact that the desert ground was hard-packed rock and stone, with the brand new ultra-light Spectre SL (atop a Thermarest, naturally) I slept better each night outside than I have on the decent mattress at home. With a temperature rating down to 20 F, the bag is fabulously insulated with sublimely comfortable 800 fill down. Remarkably breathable, this full featured bag compressed to a tiny footprint and weighs little more than two and a half pounds. I am considering setting this up in my living room when I really need a good rest. Very sturdy construction with great zippers and Velcro tabs to keep everything in place. In the desert, you must drink at least a gallon of water a day, particularly at higher elevations. Since we needed to carry our water in, I became obsessed figuring out what to carry my daily water ration in. 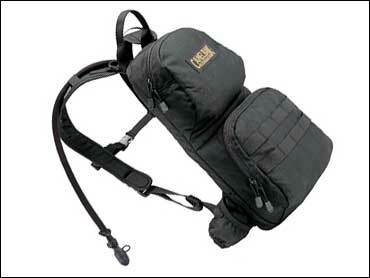 Fortunately, CamelBak lent me the mother-of-all-water carriers: the M.U.L.E, a daypack designed for our troops. Basically, CamelBak crams a three-liter reservoir into a tough cordura bag with just enough room for additional essentials you need to carry. The harness sits nicely without pinching the back. The insulated external hose is just the right length for easy sips along the way. Best of all, the "HydroLock" hose design allows instant access to water without effort using an ingenious "bite-and-drink" nozzle and a lock to prevent leaks. One of the coolest features, which fortunately I did not need to use, is the optional filtration system that snaps into the water bladder, allowing a soldier or camper to quickly gather untreated water and purify the water on the run. The bag weighs about ten pounds when filled with water. Water stayed wonderfully chilled during our desert walks and forays into abandoned mining caves along the way. Under $100. Because we brought our water in, I never needed to use my secret weapon: the MIOX Water Purifier. But I was awfully glad I found this fascinating device. In the past, campers needed to lug heavy and slow filters or iodine and other water-treatment pills to combat giardia, cryptosporidium, and other waterborne viruses and bacteria. Many of the earlier devices were ineffective against all forms of water pollutants. Using a pinch of salt and a battery charge in this nifty MIOX Water Purifier, campers can use the same water purification techniques employed by large water treatment facilities. Instead of pumping water through a filter, just take a little water, shake it within the unit to create a salt-brine solution, zap it for a few seconds and mix the oxidizing solution into your untreated water. Within a few minutes, using the supplied chemical test strips, a large amount of water is purified and ready to drink. The treatment pen weighs just three and a half ounces and costs about $129. A three-season super light tent, the Airjet comes in two and three-person configurations. The Airjet2 weighs a mere 3lbs 15 oz and features a waterproof fly made of astonishingly light and tough nylon. The tent held-up well in thirty mph winds and featured nice frills like a "window", good zippers, and a vestibule. Set up was fairly easy but during a fairly rough disassembly, part of a tent pole busted. Still, an excellent, spacious tent, at $285. I preferred the larger, more Spartan, and more expensive maize-colored tent by Black Diamond. Weighing just a hair over three pounds, the Lighthouse features a full side-door opening with netting, with a cleverly designed window that opens for ventilation and yet can be kept closed during tough weather. Roomy yet minimalist, this tent can easily house two, but I did not feel like sharing. Designed for climbers and extreme mountaineering, the Featherlite aluminum poles were easy to set up and the EPIC water-resistant shell was astonishingly light. No fly, no vestibules, no frills whatsoever. But I like the idea of a hearty storm-shelter that weighs less than a bag lunch. $369 and worth it. One of my favorite imaginative outdoor companies is Brunton, because they think outside the box. Here, with the new Solarroll, they're thinking outside the tube. Rolled and encased in a tough plastic sheet is a large, ultralight solar panel array capable of generating 14 watts of power. There are a number of similar lightweight solar arrays, but this one is the best designed unit I've seen. Only 17 ounces, the Brunton Solarroll can charge large items like laptops, car batteries, and satellite phones. It comes with a number of plugs and adapters and, best of all, can be daisy-chained to link multiple units together for increased power. The price, $399, is a bit of a shock, because you can buy an awful lot of disposable batteries for that price. But this is eco-friendly and the power source (the Sun!) should be cooking away for another four to five billion years. OK, I'll confess, I also brought a lightweight 3.5 horsepower air cooled generator. The nice folks at Honda sent me one of these bad boys and I was so impressed with the smaller EU1000i model, I could not help taking along this uber-generator. Here's what I like about it: even I could run it. Put in the gas, a little oil, turn on the switch, yank the cord, and voila: 2000 watts of 120 volts. With a single tankful of gas, this genny runs for at least four hours. When the East Coast had a blackout several months ago, I wished I had the darn thing to keep our refrigerator going. At 59 decibels, it isn't as quiet as, say, the solar array above, but it sure does turn out nice juice. Best of all, it has an inverter ideal for use with sensitive electronics (i.e., my darling laptop.) I confess, at nearly 50 pounds, this is one heck of a nutty thing to bring on a backpacking trip, but for car-camping, outdoor construction, or recharging a dead-car battery: a definite winner! They even have an "eco-friendly" mode that operates the generator more quietly and efficiently. Price: under $900. Finally, one of my favorite new tools is the ADC Pro from Brunton. This is a portable handheld weather station that computes barometric pressure, relative humidity, air density, and features a very accurate storm alarm. The device clocked winds above 30 mph on the sudden storm it warned us about. With a ski-run counter and thermometer, Brunton's Atmospheric Data Center is a handy little know-it-all that's perfect for extreme campers or simple gadget nuts like me. Suggested price: $249. It was about ten-thousand years ago that the ice age receded. Over that time, civilization emerged, animals were domesticated, technology flourished, and humankind became the dominant force on earth. Even with all the gadgets and devices and chargers and batteries and computers and tools we bring somewhat humorously into this wilderness, it is humbling to realize that within a very brief time little of the toys we hold so dear will actually still do anything. The monuments we make crumble and corrode. Over time, cities surely surrender again to nature. If you ever get a chance, look at the unlikely winner: a Bristlecone Pine tree. One thousand, two thousand years after we are gone, hopefully they will still be up there, toughing it out above the tree line.